Need a Tow Truck in Santa Ana? Go with the Best Rates and Fastest Service. Why settle for just any company with a tow truck? Santa Ana drivers deserve better. By calling Santa Ana Towing you get Orange County’s quickest and most affordable tow truck service. We’re fast, friendly, economical, and available 24 hours a day, 7 days a week to fulfill your towing needs. We're available to tow coups, sedans, wagons, SUVs, minivans, crossover vehicles, pickups, convertibles, full-size vans, hatchbacks, as well as all-wheel drive (AWD) vehicles and motorcycles. Through our medium- and heavy-duty towing service, we can typically cover the vast majority of commercial vehicle breakdowns occurring on Orange County's roadways, including tractors, RVs, municipal buses, moving vans, ambulances, semis, and others. ​No business owner wants to deal with a parking enforcement issue, but it may be necessity in order to free-up parking spots for paying customers. We will handle everything and contact the owner to ensure their vehicle is retrieved in a timely manner. ​Free Instant Quote. No Obligation! Four-Wheel (AWD) Vehicles — Autos with four-wheel drive transmissions should only be towed with a flatbed tow truck. Towing a vehicle (even over short distances) with a standard hook-and-chain configuration will likely damage the transmission, even if the car is placed in neutral. Santa Ana Towing has flatbed tow trucks available for all-wheel drive vehicles. Rear-Wheel Drive Vehicles — Like AWD vehicles, rear-wheel drive vehicles should be towed with a flatbed truck to avoid transmission damage. Classic and Exotic Cars — Flatbed towing is a better option for investment vehicles (classic, foreign, and exotic cars) as it reduces the chances of creating wear to the vehicle’s drivetrain. Santa Ana Towing is very popular among those with foreign and classic cars as we understand the pride and care that are a natural part of owning these types of vehicles. With our team you can expect diligent, white glove service. Towing Over Long Distances — Let’s say your transmission goes out, but you have a preferred repair shop across town. With traditional hook-and-chain towing, the output shaft bearings do not self-lubricate since the driveshaft is not powered. This can cause premature wear. A flatbed tow truck would be recommended in this scenario and other situations that require a vehicle being towed over extended distances. Low Undercarriage Vehicles — It’s Southern California, which means there are plenty of “low riders” out there. To protect your exhaust pipe and underbody, we offer flatbed towing services for vehicles with low undercarriages. “Junk” or Totaled Vehicles — When a vehicle’s drivetrain, axle, or wheels are badly damaged following an accident, towing it with a flatbed tow truck may be the only option. The same is true with "junk" vehicles that have acquired a lot of rust over the years. For flatbed towing in Santa Ana, call the professionals at Santa Ana Towing. We are fast, friendly, and offer some of the best flatbed towing rates in Orange County. With our team, you can be assured your vehicle will arrive safely to its destination. Need a Tow in Santa Ana or Orange County? Here’s Why You Should Choose Us. 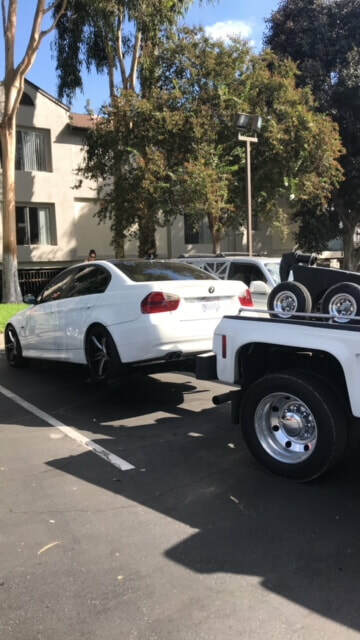 The last time you called for a tow in Santa Ana (or anywhere, really), did you suspect that you overpaid for the type of services you received? Did the tow truck operator show up later than originally promised? These two questions are more connected than you probably realize. Let us tell you why. Everyone dislikes waiting, especially when we are stranded and counting down the minutes for a tow truck or roadside service vehicle to show up. Many tow truck operators know that the longer you wait the less likely you are to bicker over their prices. And, most drivers are so relieved to finally receive service they happily fork over their money. This type of service mentality is the reason we started Santa Ana Towing. We don’t believe in wasting customers’ time or charging more than a fair price for the services we render. Owing to our punctuality, affordability, and professionalism, we remain one of the most recommended towing services in Orange County. It’s just our way of taking care of the community, one vehicle at a time. We’re available 24 hours a day, 7 days a week. Plus, we offer free quotes over the phone or by using the convenient form on this page. ​No matter what time it is, give us a call and we will be ready to serve your towing needs.